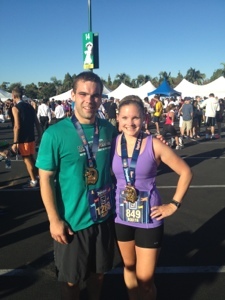 Chances were that I was going to have a fan-flipping-tastic time at the Disneyland Half-Marathon. 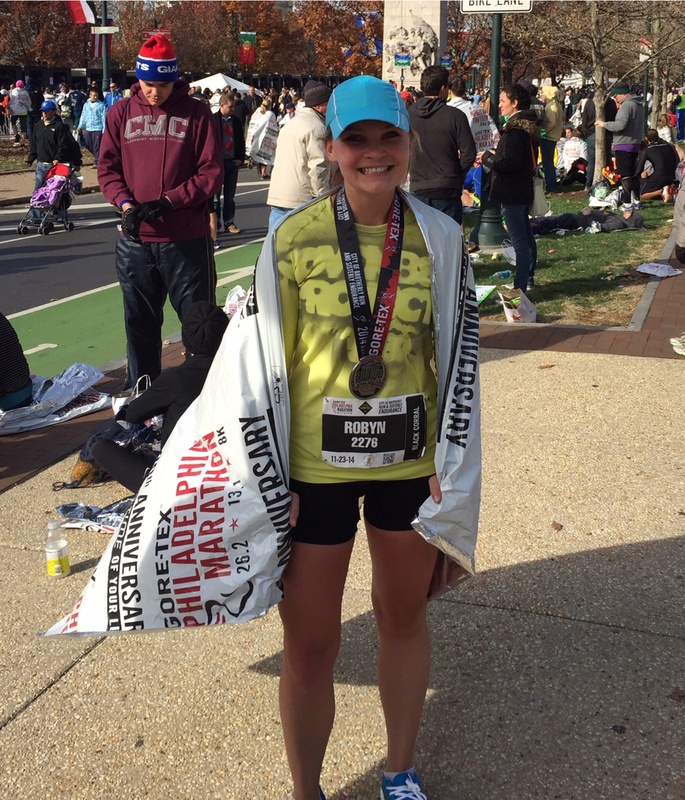 I wrote all about how obnoxiously tickled I was to be doing the race, and after the fact—it’s pretty safe to say that overall, my expectations were definitely met. But let’s start at the beginning—because what’s a race recap without expo and pre-race details? On Saturday, BF and I made our way from Pasadena, CA (where we were staying) to Anaheim to get our race packets at the Disneyland Hotel. This is about where my Disney-themed excitement really began and lasted until our final farewell to the park on Sunday afternoon. 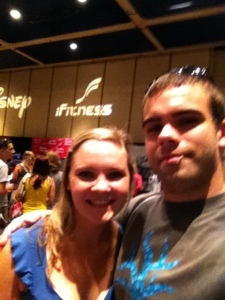 Typical expo scene—plus a boatload of Disney-themed running things, music, DJs, etc. BF has a toothpick in his mouth, he doesn’t just look creepy normally. 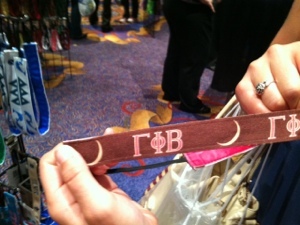 Sorority pride in the form of exercise headbands! I didn’t buy one, but I appreciated the gesture. 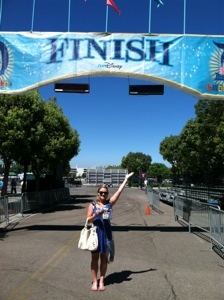 The best part was the option to SEE the finish line. I actually have never seen a finish line before the end of a race, and although I consider the finish line to be sacred ground, it was definitely fun to see where the grand finale would take place the next day. If you read my post on Friday, you know that I really didn’t have high ambitions in terms of actually “racing” this race. I never intended on taking it too seriously, plus with peak weeks for Chicago afoot, it was the best decision to lay-off in terms of speed and effort during this race. Needless to say, I wasn’t nearly as nervous come race morning as I normally am. It’s 3:45 am!!! No one has ever been up this early!! Let’s take a photo! BF and I were both in Corral A, which was very nice, and we managed to do the whole wake up-drive-arrive-park-porta potty-corral-wait thing like champs. We had enough time that we weren’t stressed out, but we also only wait for the race start for about 10 minutes. BF DON’T HATE ME FOR POSTING THIS K? After the National Anthem played, FIREWORKS went off (yes, at 5:45 in the morning) and with the shot of a gun, we were off! The race course was designed to highlight both the Disney parks as well as Anaheim, and it showed. I knew this race was bound to be impressive (both due to Disney’s reputation and the first born child fee it cost to get in, but I wasn’t expecting quite the spectacles we were given. To start off, there were spectators nearly the entire race. And not just one or two “Go Mom!” signs…like, crowds of people lining the course, cheering everyone on. And not only general fans—there were cheerleaders, volleyball teams (weird? ), bands, even a rally of old-time cars honking their horns. It was mighty impressive, and there’s something so great about getting your name called out even if it’s by a stranger. We started off going through California Adventure, winding our way through the park. All the lights on the attractions were on, so it was really easy to see everything and everyone. It was at this point that there started to be characters along the course, which was highly entertaining. They were all definitely in character in terms of the mannerisms. Oh, and just about every princess was there EXCEPT for Belle. She was probably too busy reading and being an independent woman. Mid-run photo fail. But you get the idea. After leaving California Adventure, we headed into Disneyland for a run around all the different lands. It’s surprising how much smaller Disneyland feels when A) you aren’t 7, B) you’re running through it, and C)there aren’t hoards of people to meander around. 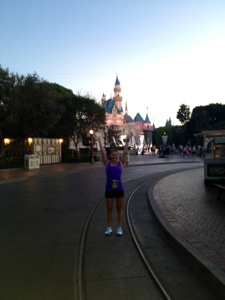 Perhaps my favorite part of the race was when we ran down Main Street toward the castle. I got all kinds of giggly and we stopped for a photo. Dark shot…but you get the idea. At this point, the course was still decently crowded. I normally don’t mind crowds too much, but with BF and I staying together the whole time, all the weaving was a little annoying. But relatively speaking, everything was still well and good, and without a goal time—we really didn’t mind the bunching. 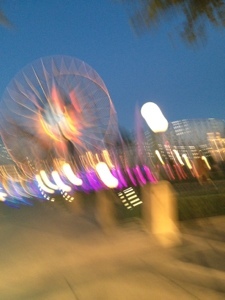 When we left Disneyland, we were around mile 5 or so and for all I knew we hadn’t really been running at all. 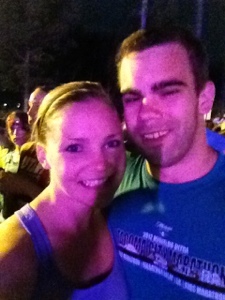 BF and I were clocking a cool 8:50 pace or so, and I was so distracted/enthralled with the whole thing that it barely felt like a race. The next 5 or so miles took us through Anaheim toward Angel Stadium. These miles were definitely less scenic than the rest of the course, but the race did a good job of making sure there were still groups cheering along the way. There was even an authentic mariachi band and Spanish dancers which was great. There had been a few rolling hills at this point but really nothing significant. It was flat mostly, and it felt like a course someone would choose for their own run, if that makes sense. Around mile 10 we came into Angels Stadium which is where the real cheering began. The stands were piled with all kinds of people cheering, and it was really encouraging to run into a professional ballpark feeling like the competitor. We ran nearly all the way around the warning track of the field, and they projected all the runners on the big screen by the scoreboard. You might be wondering exactly how I/we were feeling at this point. I know race reports are typically filled with minute-by-minute details of when every Gu was consumed and when each calf began to cramp. But honestly, I have never felt better during a race. I almost felt like I was on an easy recovery run rather than an actual half marathon, and by Mile 11 I felt it might as well have been Mile 3. I did have, by the way, only two cups of water and no Gus during the race…and I choked on both cups. Still a skill I need to learn. However, he went almost two weeks without running at all (severely rolled ankle) and it wasn’t until two and a half weeks ago that he actually even started running again. He maxed out mileage at 8.5 miles last week, and although he was pretty confident he could finish the half—he knew it wouldn’t be pretty. And although he was definitely feeling it around Mile 11—I was in awe of him. After very little endurance exercise, clocking 8:50 and below miles consistently is pretty damn awesome—especially when that’s only slightly above what he does when he’s in great shape. He was a rockstar. We picked it up a little bit toward the end, and I asked if he wanted to hold hands across the finish line. He was game, and as we approached the end both of us were getting so excited and we picked it up a lot. Once the finish line was in sight, I knew we’d finish in under 2 hours (which wasn’t even a goal) and..behold, Mickey and Minnie were at the finish line! So, despite my hand-holding idea and BF’s compliance, the poor boy was left holding his hand out unheld while his Disney-freak girlfriend scurried over to Mickey and Minnie for her euphoric finale. The photos are hilarious, and in the end we did hold hands across the finish line, but not before I got to slap those big gloves of love. For a race with no goal other than to go slow and have fun (and stop and take pictures!) this wasn’t too shabby. Mostly, I was just impressed that BF was able to pull off such an impressive display without much training. And as for me, the race might as well have been 5 miles. It FLEW by, and I credit that to going slower than normal but also how much fun it was to see and hear everything going on. I LOVED not wearing headphones for this race, and it was really nice to be able to chat with someone the whole time. I’m not convinced these strategies would work in an actual goal race, but for a race with no agenda—it was perfect. Ignore Mr. PhotoBomb in the background. Going to the Minnie and friends BUFFET breakfast was perhaps the best idea I’ve ever had. 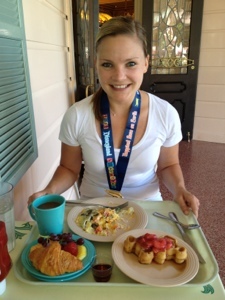 Refueling from the race and prefueling for Disneyland at its finest. The heaviest/coolest medal ever. We wore them all day. 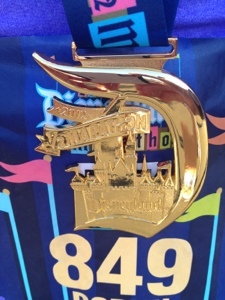 Have you ever done a Disney race? What did you think of it? Did you dress up? Were you up as early as we were? 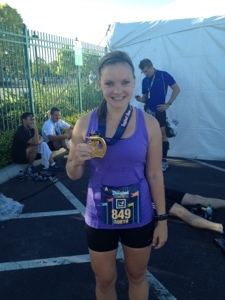 This entry was posted in Half Marathon, Race Recap, Running and tagged Disney, half marathon, race recap, running on September 5, 2012 by runbirdierun. YAY Robyn this sounds so fun!!! I hope I can do it one day too!!! 1) you are a rock star! 2) your boyfriend is a major rock star. Impressive finish and time from little training! 3) who did you stop and take pics with? 4) can’t wait to hear about your day at Disney! 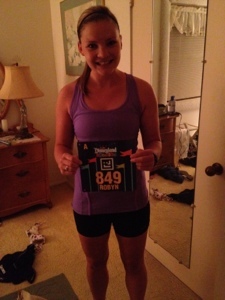 5) I want to do this race!! So fun! !